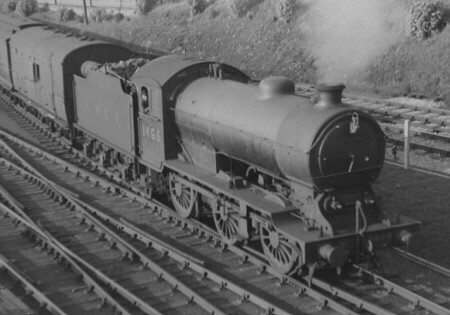 Although the J38 was the first LNER Group Standard design and was also an 0-6-0 goods locomotive, only one small batch of 35 locomotives were built. The J39 appeared later in 1926, and was essentially a J38 with larger wheels. It became the new LNER Group Standard 0-6-0 goods locomotive and was built in large quantities. A total of 289 J39s were built over fifteen years, making it the most numerous of Gresley's designs. The first outline diagram for the J39 was produced in September 1925 and the first locomotive entered service in September 1926. The design was very similar to the J38 and incorporated very little influence from Doncaster. All of the J39s were built at Darlington except for one batch of twenty eight J39s built between 1926 and 1937 by Beyer, Peacock & Co. Many of the Darlington J39s were built with boilers constructed by the contractors Armstrong Whitworth & Co, and R. Stephenson & Co. The frames were 29ft 3in long: 6in shorter than the J38 frames. The wheel diameter was increased from the J38's 4ft 8in, to 5ft 2in. The height of the underside of running plate above rail level was identical to that of the J38. Considering the change in wheel diameter, this was achieved with 6in deep splasher casings. The lack of splashers on the J38s, makes this the clearest distinguishing feature between the two types. Two main tender types were fitted. From December 1930, those with the Group Standard 3,500 gallon tender were referred to as J39/1, whilst those with the Group Standard 4,200 gallon tender were referred to as J39/2. From 1934 the sub-classification of J39/3 was introduced for all of the remaining locomotives which were still running with old North Eastern Railway (NER) and Great Central Railway (GCR) tenders. The tender sub-classifications were dropped in December 1952. The other main variation concerned the type of power braking installed. The first twelve locomotives had Westinghouse brakes for the locomotive, tender, and train; and vacuum brake for alternative train braking. These operated in the North East (NE) section, and twenty locomotives built between 1928 and 1929 for the Great Eastern (GE) section were similarly fitted. The remaining J39s built until 1934 were fitted with a steam brake for the locomotive and tender, and vacuum brake for the train. From 1935, the J39s were built with vacuum braking only. The NE section Westinghouse J39s were converted to steam braking during the 1930s, but the GE section J39s kept their Westinghouse brakes until disposal. As well as these main variations, there were other smaller variations as would be expected over such a large class built over an extended period. The first forty four J39s had steam reversing gear, sight feed lubrication, and vertical slide regulators. The next 52 had screw reversing gear, a pair of mechanical lubricators, and Owen regulators. From 1935 the axleboxes were lubricated with a Fountain sight-feed lubricator, and were fitted with a new type of twin-handled slide regulator. Superheaters of the Robinson long return bend type were fitted as standard. No. 1270 was built with a Cruse-Gray superheated supplied by Bolton's Superheater & Pipe Works (see picture). This superheater is reported as heating the steam by about 100 degrees Fahrenheit in excess of the standard Robinson type. Gresley was impressed enough to consider ten sets of the Cruse-Gray superheater for D49 4-4-0 locomotives. Although Bolton's were asked for a quote, no order was placed. The superheater on No. 1270 was removed and replaced by a standard Robinson type in August 1931. Common with many inside cylinder 0-6-0 designs, the coupling rod throws on either side were separated by 90 degrees. The coupling rod throws were 180 degrees from their adjacent connecting rod cranks. The net effect was a twisting force on the axleboxes. Due to the powerful nature of these locomotives, this twisting force was particularly severe and resulted in heavy maintenance. The Darlington Mechanical Engineer reported to Gresley in 1938, that the axleboxes were experiencing heavy wear and that the right axleboxes tended to overheat more than the left axleboxes. Gresley had also observed this on other inside cylinder six-coupled locomotives. Various axlebox modifications were tried, but these did not lead to an improvement. The possibility of reducing loading by placing the coupling rod throws on the same centres as the connecting rod cranks was considered in 1946, but not acted upon. Divided axleboxes were fitted to six locomotives from 1947 at Gorton Works. After 1950 it was decided to not fit any more divided axle boxes and to remove those that had already been fitted. Thompson's standardisation plans included a plan to use the J39s to replace all 0-6-0 types with an axle loading in excess of 18 tons. This plan did not anticipate the construction of many new J39s, because the new standard 4-6-0 B1 type was expect to take up many of the 0-6-0 duties. In 1946, plans were drawn up to fit L1 Diagram 115 boilers to the J39s. This boiler had a smaller diameter and would have reduced the weight of the J39s to 54 tons 10 cwt. The proposal came to nothing and was officially dropped in February 1949. The Scottish Area had just received all 35 J38s, so the first J39s to be built were all allocated to the NE Area and the Southern Area. Later orders would include numbers for the Scottish Area as well. Re-allocations of J39s between areas was unusual. In 1947, many of the Southern and Scottish J39s were swapped due to the types of brakes in use. Also after Nationalisation (1948), the areas changed their geographic extents and needs varied, leading to more re-allocations. The J39s were powerful and versatile locomotives, and could be seen throughout the LNER network. As well as being called upon to haul general goods trains, they were also used to haul heavier oil and coal trains. Although primarily a goods locomotive, the J39s did make appearances on passenger trains, especially on summer excursions during the 1930s. Although not designed for higher speeds, these passenger duties included faster running including express services. From 1946, B1 4-6-0s took over most of the J39 passenger duties although they were still occasionally called upon in emergencies. Withdrawals started in 1959 and were very quick with all 289 J39s being withdrawn from service by the end of 1962. This rapid withdrawal of the class was due to higher than average maintenance costs due to the hot axlebox problems which were never solved. No. 64747 survived at Woodford shed as a stationary boiler, until October 1964. Tender details are for the Group Standard 3500 gallon tender. Heating Surface: Total: 1669.58 sq.ft. All of the J39 locomotives were scrapped and none have survived into preservation. Ready-to-run models of the J39 are available from Union Mills for N Gauge, and from Bachmann for OO Gauge (4mm scale). GEM Model Railways have re-introduced the original GEM N Gauge kit of the J39. The 3mm Society produce a kit of the J39/1 for 3mm scale. 4mm scale kits of the J39 are also available from SE Finecast, Proscale, and Dave Alexander. Connoisseur Models sell an etched brass kit of the J39 for 7mm scale (O gauge). Bassett Lowke have also produced a ready to run model for O gauge. Thank you to Malcolm Peirson for the photograph of J39/1 No. 1465.